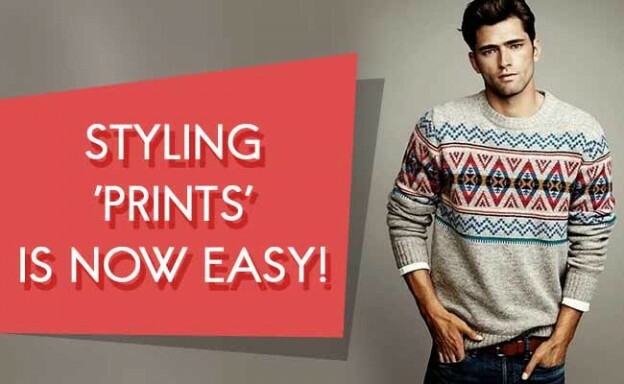 Styling ‘Prints’ is now easy! Styling prints and patterns turn out to be little massive. There are numerous styles, patterns and prints available, but all you need to do is style them properly without making any fashion disaster. Read our style guide to know more. Plaid/Checks: A checked shirt is a must have in every wardrobe; it has a tendency to elevate your dull outfit. Since winter colors are mustard yellows, greens, reds and dark blues. Finding shirts in these colors will be easy for you to team it with chinos, denims or jeans. Definitely, perfect to feel warmer. For casual wearing, pull off a smart casual printed shirt, wear it with your favorite jeans with sneakers or loafers, whatever you are comfortable with. Knitted Jumpers: Before we begin with this; make sure you stay away from Christmas color knitted jumper – you are not a santa claus. This can be worn only on Christmas Day. The best thing about knitted jumpers is they can be dressed down perfectly. Go for a plain shirt and wear it underneath your jumper, creating a clean, simple look. You can wear chinos or jeans for a neater look. Go for the block pattern to keep it balanced. Stripes: If patterned jumper is like a Christmas party and chcck shirt is too heavy for your style, you can go for stripes. You can make the combination as per your choice like you can mix white and navy or black and white, grey and black for darker variations. Wear a striped jumper with navy jeans with black trainers and complete your look with a bomber jacket for sleek and structured look. Camo: This print come and go, but eventually gets re-invented in different ways. You can wear camo print in hoodies and chinos. If you are styling camo pattern, go for something in plain black or a white T-shirt with plain jeans and boots – preferable combat boots. Well, this is the perfect look! So, Gentleman! Bring all your prints out and let it be the main fashion feature this time.